" Weather Report meets Fela, you might say. They are good enough." intelligent gang of musicians able to produce arrangements that are complex but at the same time clean and powerful. 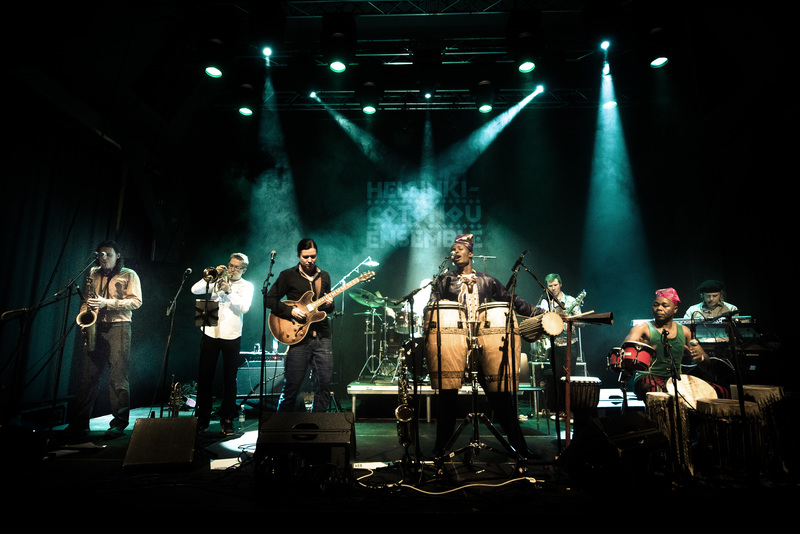 Drawing inspiration from the roots of Afrobeat, they use their jazz experience to expand on Voodoo rhythms with a modern urban touch.Their live performances put Finland under fire for the whole summer 2013. HCE's story is rather unique. In january 2012 three musicians from Helsinki, Finland followed their dream and travelled to Benin, West-Africa. 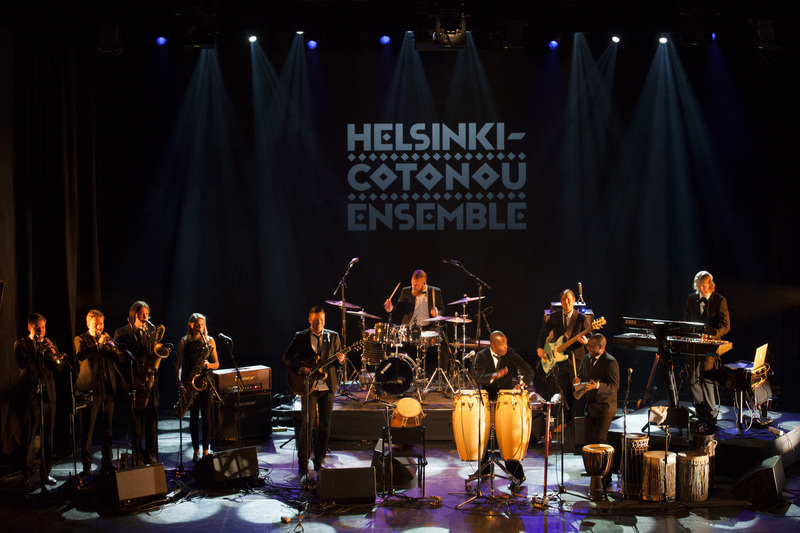 They hooked up with virtuoso singer/percussionist Noel Saizonou, called up the best musicians from the country's biggest city Cotonou, and so was the first edition of Helsinki-Cotonou Ensemble born. During the period of six weeks, the group went through some incredible adventures in the homeland of Voodoo, rehearsed daily, played three shows and recorded an album. Later the album was completed and mixed in Finland, and it's release on May 7th 2013 was followed by a tour of 19 concerts and plenty of acclaiming press. HCE's music is all written by the band's guitarist Janne Halonen and percussionist/ lead vocalist Noel Saizonou. The writing process started as early as 2009, when Halonen first travelled to Benin to learn the traditional rhythms of Voodoo. For three years Halonen and Sazonou bounced ideas and searched for the right people for their project. When Sazonou visited Finland in 2011, drummer Juha Raesaenen and bassist Sampo Risikilae joined the project. The quartet became the core of HCE, and it was to be strengthened with local super musicians, whether the band operated on European or African soil. The current and for now established line up of HCE is listed below. Helsinki-Cotonou Ensemble impresses it's listener not only with intense moods and joyful yet virtuoso performances, but also with fresh and carefully crafted songwriting. As composers Sazonou and Halonen are enough far apart to make the cocktail something completely new, yet they both possess enough musicianship to complement each other's works. In January 2014 the dynamic duo sat down once again for 3 weeks on the sunny beaches of Grand-Popo, and finalized their sketches for the 2nd record. Another took place in the summer taking the band to stages of Finland, Sweden, Denmark and Italy. In November the second Album "Fire, Sweat & Pastis" was released in Finland, and only few months later it received the Ethno Album of the Year award. International release of Fire, Sweat & Pastis will take place on 25th of April by German Flowfish Records. Helsinki-Cotonou Ensemble releases Fire, Sweat and Pastis and tours Canada in July 2016. Finnish guitarist Janne Halonen was obsessed: He couldn’t stop listening to Lionel Loueke, the guitarist in Herbie Hancock’s ensemble. He knew Loueke was from Benin, and had to know what made his music tick. Before he knew it, his fascination took him to Benin. The country is home to Villa Karo, a Finnish-African cultural center established fifteen years ago to promote exchange by writer Juha Vakkuri, who wanted to spread his passion for the continent. There, Halonen met Noël Saïzonou. 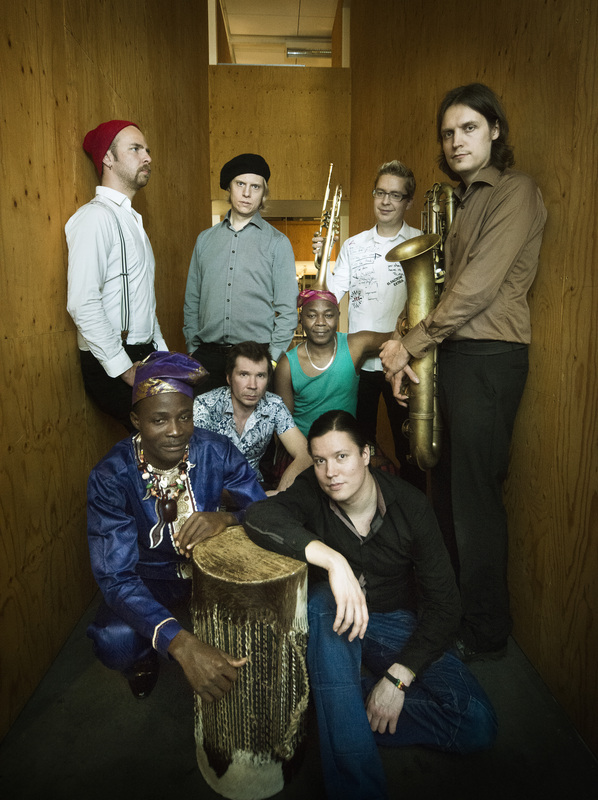 The two connected and the unexpectedly perfect Finn funk-meets - Voodoo rhythms of Helsinki-Cotonou Ensemble was born. 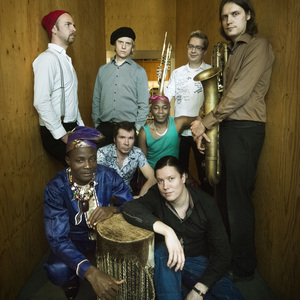 On Fire, Sweat and Pastis (release: July 7th 2016), the Ensemble’s second album available in North America, the octet of musicians experienced in jazz, funk, R&B, and traditional Beninese music intertwine the percussive rhythms of West African Vodun with funky basslines, soulful call-and-response vocals, and virtuosic brass and woodwind melodies. They invite listeners to join them on a musical journey that is equal parts celebration and reflection. Travelling to Cotonou, Benin’s most populous city, for the first time in 2009, Janne explains, “I was asking who is The Man? Who should I meet?” Everyone pointed to vocalist and percussionist Noël Saïzonou. “The first time we met we greeted each other like old friends,” remembers Janne. What followed was several years of songwriting sessions as Noël came multiple times to Finland. They learned about each other and crafted their sound. The lyrics are collaborative, Noël composing in Goun, his mother tongue. Onstage he banters with the audience, playing the role of conductor. While on tour in Africa, Janne encouraged Noël to speak to the audience. “He would ask people to listen to the lyrics. When there was something really specific in the lyrics people like, they’d applaud,” explains Janne. Fire, Sweat & Pastis is an energetic statement bursting with the desire to celebrate and share their music. And composer Janne Halonen has crafted a complete journey. An album that knows exactly when to change pace, like stopping to rest your tired feet at just the right moment. “Interlude Part 1” and “Interlude Part 2” feature thumb-plucked Kalimba, melodic acoustic guitar, rolling Fender Rhodes, galloping hand drumming, and thumping bass in casual conversation with each other. “Minin Vodjo” opens with light percussion, as Sampo’s buoyant, funky bassline is grounded by Visa Oscar’s sustained keyboard harmonies. Noël leads the band with his assured verse, singing in counterpoint to the ensemble’s refrain. Then the horn section comes bounding in, featuring Mikko Pettinen on trumpet and Joakim Berghäll on saxophone. Aided by Sampo and Juha’s interactive bass and drums, the song builds in intensity to the finale like a cresting wave crashing into a rocky shore. “Light is fading, the road is long,” sings Noël on the opening track. “Feet are aching, but we carry on.” On this road, Helsinki-Cotonou Ensemble celebrate every step. Listening to each song on Fire, Sweat & Pastis is like stopping at a sleepy, roadside town, only to discover it is the place you’ve always longed to be. 07/07/2016, Album Release, "Fire, Sweat and Pastis"